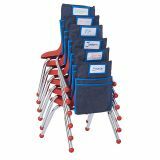 Includes (6) 10" Stack Chairs with Classroom Seat Companions. Denim Seat Companion slips over the back of the chair to keep notebooks and supplies within reach. Specify seat color. Includes (6) 12" Stack Chairs with Classroom Seat Companions. Denim Seat Companion slips over the back of the chair to keep notebooks and supplies within reach. Specify seat color. Includes (6) 16" Stack Chairs with Classroom Seat Companions. Denim Seat Companion slips over the back of the chair to keep notebooks and supplies within reach. Specify seat color. 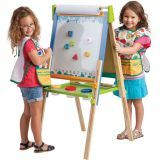 Includes (6) 18" Stack Chairs with Large Classroom Seat Companions. Denim Seat Companion slips over the back of the chair to keep notebooks and supplies within reach. Specify seat color. 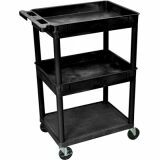 Luxor's HE, STC, TC, and Tuffy utility carts are made of high density polyethylene structural foam molded plastic. A push handle is molded into the top shelf. 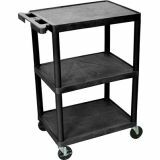 Shelves and legs won't stain, chip, warp, crack, rust or peel. Easy assembly. Made in USA. 49"H x 15"W x 12"D framed safety acrylic mirror. 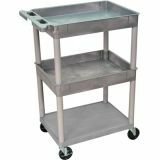 Can be used vertically or horizontally with included feet. Mirrors have 12" base supports. 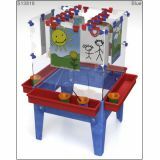 Features 2 storage trays, 2 marker trays, a wire book holder, plus it's mobile and economical! 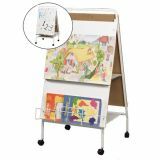 Folds for convenient storage and includes wire book rack that keeps books handy for teachers, 2 full-length marker trays, 2" locking casters, middle and lower trays provide exceptional storage areas for accessories and supplies. Melamine writing surface is 30"W x 43"H.